Did you get a chance to hop along yesterday for the Hello World Blog Hop?! If not, you can click here for my blog post. I wanted to share a couple more cards with you today. 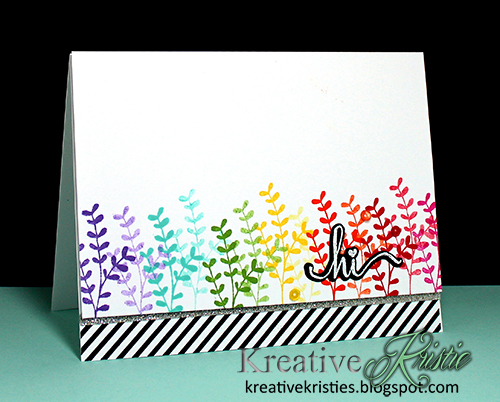 I used one of the leaf stamps from the Lovely Flowers stamp set to create this fun rainbow image. The hello is part of the Hello World stamp set with matching die and that lovely black and white stripe on the side is a new stamp from Yay! Stripes. Another card using the same supplies but using the hi stamp and matching die. LOVE the little heart dotting the i!!! All profits from the sale of the Hello World stamp set and the coordinating dies from Saturday Oct. 1-Friday, Oct. 7 will purchase computers and other school supplies for Sean's classroom. So cool, right?!!! 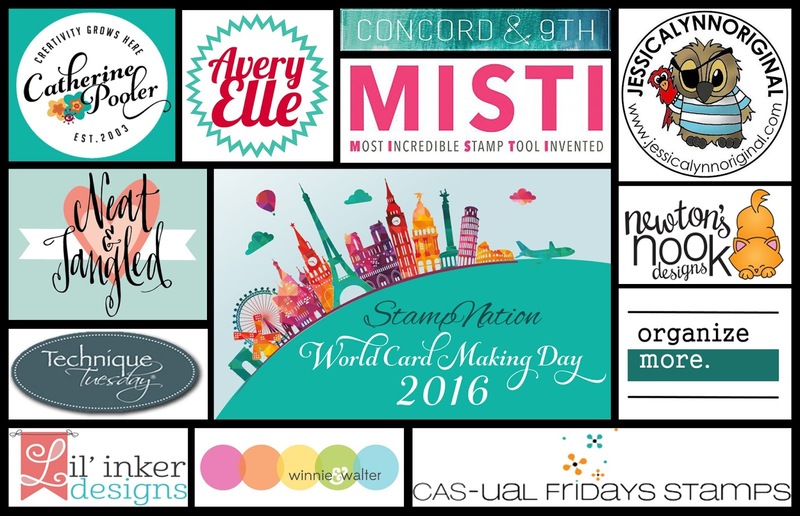 All of the stamp sets and dies I used on my cards today can be found HERE!! I wanted to let you all know that we have been celebrating WCMD all weekend long over on StampNation! This is our biggest event of the year and the participation all weekend long has been incredible. We have approximately $450 worth of prizes up for grabs! WOOHOO!!! Challenges are always open, but for your chance to win one of the amazing prizes submit your cards by Oct. 22nd. Gives you plenty of time to play along. These new additions are gorgeous! I love that rainbow swirl of color! Wow! Another pair of delightful cards! The colors are so happy! Love your innovative use of the leaf sprig in these fabulous cards Kristie. Really love both your gorgeous cards, Kristie! Gorgeous cards Kristie - very inspiring. I had to order the stamps! So bright and cheerful! I can't wait to try my stamps when they get here!